I totally bonked during yesterday's run. totally understandable. I had very minimal calories and had just worked out my upperbody for almost 2.5hrs. 4 miles into the hill run, I just seemed to turn into rubber. I felt fine really but the strength to run evaporated. I walked the last 2 miles. Need more calories to sustain this level of training. Today I felt better but didnt have time for a full workout. Im dropping the use of BCAA's because I just dont feel a difference when I use them or not. 12:05 56g unflavored whey protein with 1/4 cup maple syrup. I am loving the benefits of Herschel Walker high volume workouts. The Dip numbers have improved drastically especially the sets after the first. That was 217 reps over the course of 35 min. Averaged out is only 6.2 reps per min. Im wondering if there would be a benefit of fitting in way more reps per min on average by increasing the number of sets. 500 reps in 30 min would be 17 reps per min, or I could do 15 reps per min for 34 min. Sounds like a good experiment to try. I love this s**t! will try this with all the other exercises too if I get a good feeling about it. 500 reps of dips or pushups in 30min is no joke. 15 Pushups per minute until I could not get 15 reps done in the set. I got 34 mins till I failed and dropped to the floor trying to get the 15th rep.
33x15,1x14 = 509 reps in 34 min. I did it with push ups since I did max out dips yesterday. I picked 15 reps per min and did them as fast as I could as to get the most possible rest per min. That worked pretty well until the last few sets as it go harder to do the pushups fast. I think this is a good addition to what I have been doing and will really help get alot of volume in a short period of time. Im thinking I will be able to increase reps per min up to a certain point where the rest time is so cut down that sustaining will become impossible. But 20 to mabye even 30 reps per min should be an attainable goal. Whoever says high reps dont build muscle is FOS. My pecs are freakin balloons. And I am adding weight even with all the running Im doing. 10:30 started pull ups while cleaning up outside. I had a coupe tangerines off the tree during one of the rest periods. I ate a couple of dates during one of the rest periods. The reason I am eating while training is to see if when I go for my run I feel better. 5 mile run. Was on the road today, not exactly a flat run though. 8 min pace easy run for recovery and tightening form. I felt great, no bonking. Got home and ate up. 2:00 large pile of pulled pork with bbq sauce, potatoes, carrots, 2 pb and honey sandwiches. Now I need some alkaline foods to balance out all the acidic foods I just ate. I have had about 2 cups of my ginger brew through out the day. Also had 2 g beta alanine and 10g glutamine this morning. I have cycled off creatine use for the last couple of weeks. 7:00 1 PB and honey sandwich, extremely large bowl of homemade ramen broth with chicken, one head broccoli, 3 cups of spinach. Friday had no time to train. had to get the house ready for a Christmas party and cook for 13 people. I did get away from work for a bit and made an attempt at the dips Christmas Tree. I got 9 rounds plus 12 reps. As I looked over the video I noticed that I could have gone further down and I had a slight kip with my legs. I bend legs at knees and tuck them behind. Ready to blast this Christmas Tree. Doh. I lost count on the 9th round and ended up only doing 10 reps. Oops. I fixed the range of motion but the slight kip movement was still there. I need to retrain these dips. Pecs are blasted from yesterdays dips. I took about 15 seconds between exercises and 3 min rest between rounds. Did 2 more sets of pull ups of 10, 5 to round off the total pull ups to 150. Woke up a little late this morning. 8:30 Juiced 1/2lb ginger root and got 6oz of juice. Drank 3 oz and put rest in fridge. macca root powder, bromelain. 10:30 Run - 6 mile hill run with 2000' of climb. done in 1:03:00. Not bad, I had a slow pace due to residual leg soreness from yesterdays squats. I wonder how much faster I could do it with fresh legs. I seem to run way too fast early when my legs are fresh and then putter out, so my runs on sore legs usually go better. 4:00 8oz pulled pork with bbq sauce. I wasnt going to run today but I got my tire harness completed and was too excited to try it out to wait. 10:15 Test run of tire drag harness. Worked perfect. Went for a 2.5 mile drag. Time 24:50. That was awesome. It was raining so there was less drag but the tire filled with water. Great workout regardless. 11:00 30g whey with 2 tbsp maple syrup. Wanted to do more but legs were feeling weak. Not super powerful all around but a light workout sometimes is good. When people want to know how to increase there performance/diet, they need to come here. Dragging tires great/ diet, straight determination here. Thanks Ironloo! I learn from the best. 12:00 Hill run 6 miles with 2000' climbing. Was much faster on uphill today but slower on the downhill sections. It was raining, the rain had washed most of the soft lose dirt away and left mostly a rocky trail. My feet were getting beat up and were feeling weak. Time 1:01:06. 1:15 30g whey protein w 2tbsp maple syrup, 4 dates, 3 oz ginger juice. 3:30 whole head of roasted garlic with sprouted grain bread and butter. wow first day I have had minimal fruit and veggie intake. will remedy that. 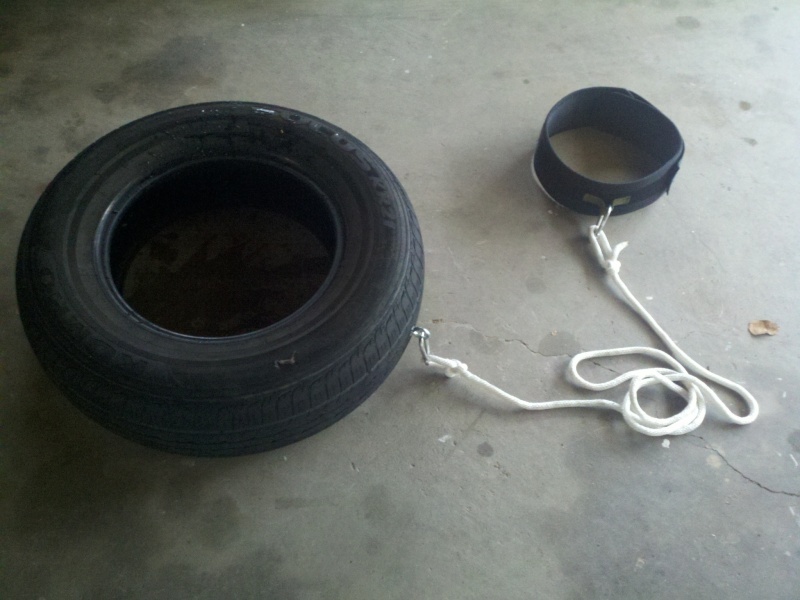 My tire drag harness. Not a huge tire more for endurance. 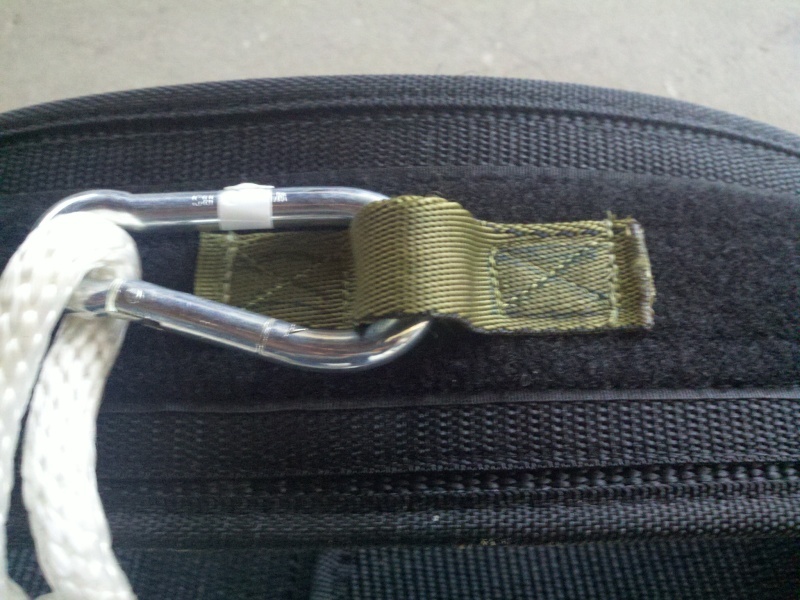 Weight belt $15.00 + Alteration to weight belt $15.00 + rope and hardware $15.00 = total cost $45. Tire was free. Good alternative to the $80 drag belt at sports store. Added a nice pull up bar to garage, has clearance for MU. 4' x 1 1/4 OD black pipe and 2 floor flanges was $37.00. Suspended bowling ball behind for very hard pullups. Bowling ball was free. 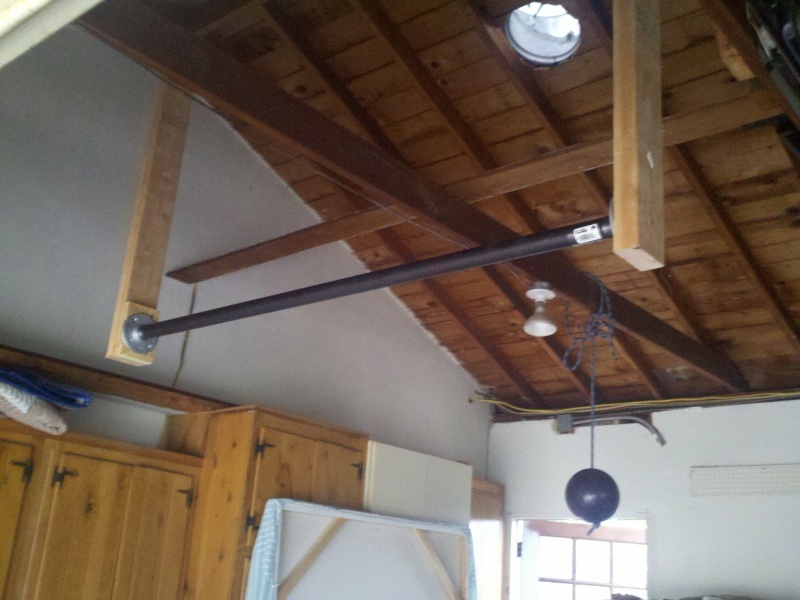 13 or 14lb ball on 4' x 1" OD black pipe for mace exercises. Sledge is 8lb. Practiced mace exercises yesterday and did a full mace workout this morning. Am working up to the mace by using the sledge for some of the movements. Shoulders hit hard. Very good stuff. Diet got away from me a bit this weekend. Cant seem to say no to pizza. Also had some ice cream. I dont do so well with refined flours so its aggravating to give in and deal with the consequences for days afterward. legs felt great but I didnt push too hard, downhill sections felt hard because of some slight knee pain so I was pretty slow going down. I need to find a trail that isnt so climb focused. The major thing slowing me down on the uphill sections are my calves. Got no bounce in my step going up. I think I will do some uphill tire drag sprints to strengthen my calves. Maybe tomorrow or the next day. Yeah man, I wanted to make the tire drag belt after watching Running the Sahara. 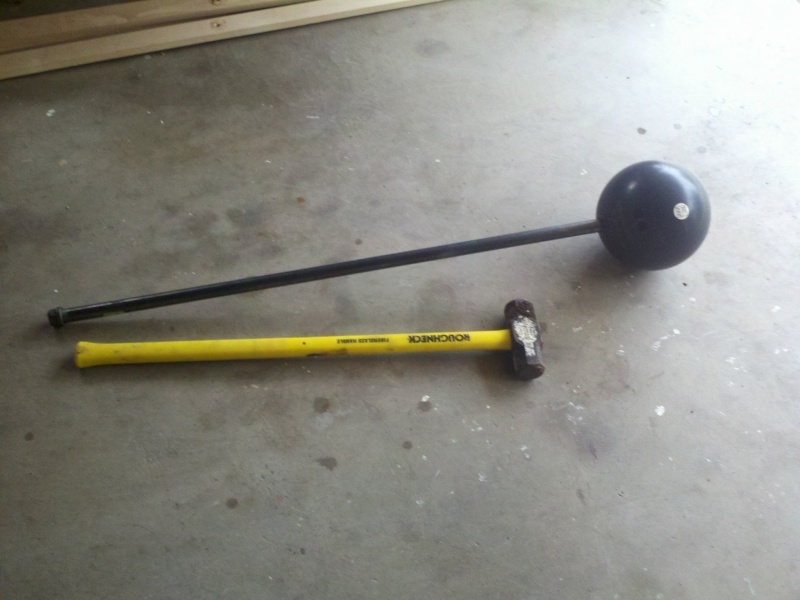 Ironloo mentioned bowling ball pullups, and when I found 2 on the curb he suggested the mace. Great stuff. bowling ball pull ups are very hard. I get less than 50% of reps I can do on bar. Mace canoe paddle rows. made this one up. hold mace just like a canoe paddle and row in a circular motion. if you have ever been canoeing youll get it. 2 x 10 each side. Mace curls. grabbed handle about 14" out and started curling then choked up on handle as I hit fail at that grip pos, continued till grip is all the way up at the ball. 2 x each side. 35lb dumbbell curls 1x8 each arm. 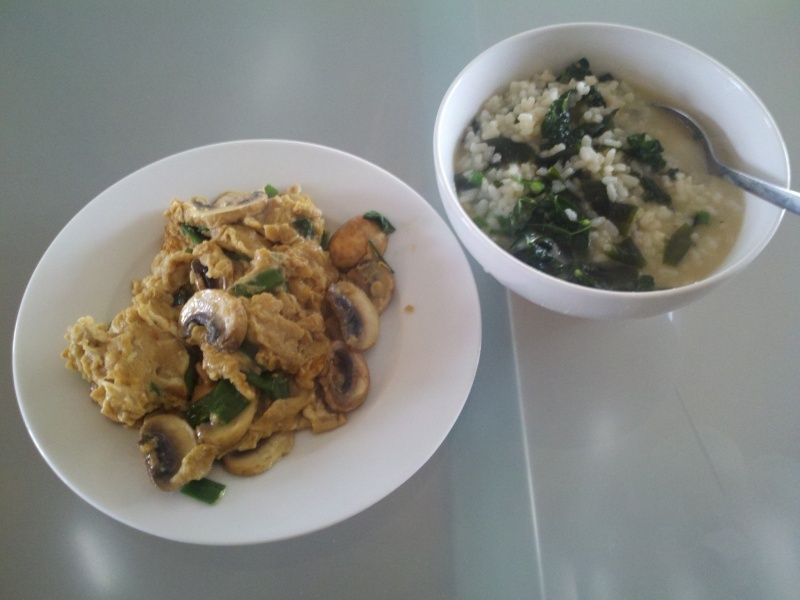 11:30 3 eggs with green onion and mushrooms, soysauce and agave nectar. This is Oyako don style eggs. 10:00 Roast chicken, 1 yam, 2 cups kale w/ lemon juice and hemp oil dressing. stayed up too late, just wasnt tired after my late dinner went to bed at midnight. Rocked a 3 mile tire drag. Pavement was dry today so the friction was full on and my legs were feelin it. Done in 34:00. I was only planning on doing 2.5 since my last 2.5 it was wet and less drag. I felt that since it was dry that was enough advancement....but as I reached the turn around, sucking wind, I said what the hell, its only another 1/4 mile to the next turn around and blasted ahead. I will def be going 4 miles with the tire next time out. Kinda done logging all the diet stuff. its too much effort at this point. I have a supplement and eating schedule that is pretty dialed at this point so there isnt really a need for me to log it in any more. Any questions about that can be on PM. More running. Gotta get my pace up. Endurance for the long haul is there but speed isnt. 1 mile repeats with 5 min rest. 1 and 3 were uphill at a slight grade. 2 and 4 downhill at the opposite. I will get faster then shorten rest times. For the next 3-4 weeks I will incorporate this speedwork 2x per week, also 6 mile trail runs 2x per week and 4 mile tire drag 1x per week. Last 7-10 days before race will drop speed work and focus on full recovery and maintenance. Im not sure how to include my upper body work but will figure it out shortly. Im pulling back from the massive pull volume I have been doing the last 2 weeks. Back needs a rest and rebuild. I did the Sosna Pull/Push pyramid but it wasnt feeling right and aborted at 7-7. Got there with no rests but still didnt feel right. Trail run- up 1000' in 1.5miles in 18:10 then down 1/2 mile then back up to top then ran back down. The downhill sections are getting pretty rough due to all the rain we have been getting. A great deal of soil, that cushions the feet, has been washed away leaving it very rocky and my feet extra sore. Haha! I just surpassed my high school mile time of 5:50. I will break into the high 4's this next year. I will see just what my legs can do. Early Christmas presents from a good friend. 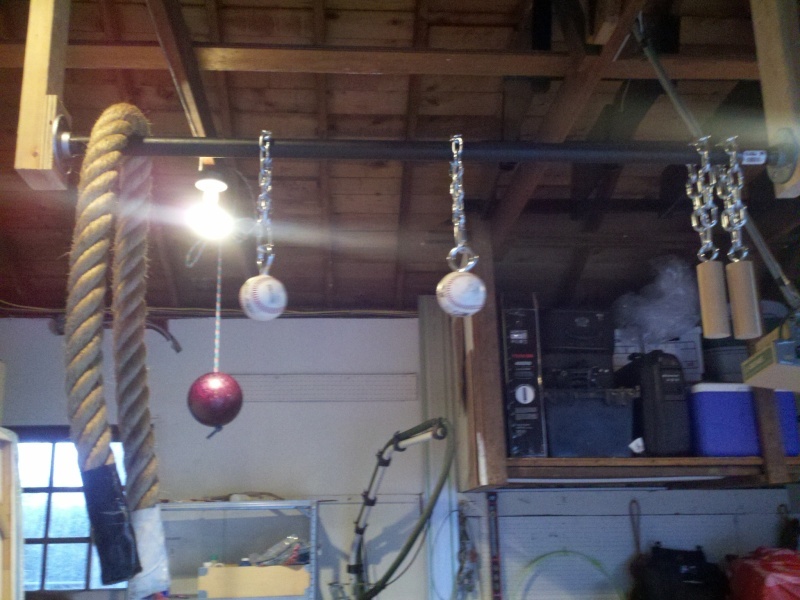 pull up accessories: baseballs, dowels, and also got an ab wheel. Very nice presents. Got 11 baseball pullups when I got home. I have got a lot to report. I havent been keeping up with the log and lost track of a couple of weeks of workouts but I will fill in for this last week. I realized about 2 weeks ago that I have no idea how to peak and taper before the spartan race coming up on the 28th so I called my coach friend for some tips. Between Christmas and New Year I did 3 runs and no upperbody. right now Im working to preserve upperbody strength/endurance and focus on gaining speed and endurance in the legs. I have also changed up the diet a bit to compensate for the endurance running. Much more carbs. and some other great sups I will let you guys in on. Out with lean gains and back in with breakfast. I cant afford to bonk on a run after a strength session. I am mixing up the running training by ading some threshold training(1 mile and 2 mile repeats) and some longer road runs. That felt great. I beat my best time and wasnt even running hard. Cowles Mt/ Pyles peak trail run 6+miles with 1800' climbs in 56:30! Wow that was amazing I didnt exactly blast up but I climbed as fast as ever on very sore legs wasnt winded at the top after making it up in 18:01 just 3 sec off my fastest time and then proceded to blast the rest of the trail. I made it to the turn around at Pyles peak 2 min faster and knocked of 3min off my previous best. I cant wait to see what I can do with fresh legs. 7:30 2 cups rice, large ground turkey patty, large salad, water, fruit, more fruit and salad. Hey, I see I influenced you regarding the MSM. Yeah man MSM is amazing stuff! thanks for the heads ups. It has so many benefits just like so many other natural supplements but the thing I noticed right away is the energy and endurance boost I got right away when I started taking higher doses of pure crystals. Oh and I have made the mistake of taking too close to bed time and couldnt sleep at all. now I wont take it after about 5pm and Im good. 4-5g 2-3x per day. I cant find any research stating this but I have found high doses of fresh ginger to be the best pre workout/ pre run energy enhancer I have ever used. I took a day off today, yesterday did an E pace run of 7 miles in 52min. Im a little bummed as I can see some of my bulk going away with all the running I am doing. Im not just getting leaner either. I am working on maintaining my upperbody strength and conditioning while focusing on the running. I am finding myself really liking the runs and wanting to get faster and faster. I would like to find a way to be super muscled and fast over long distances but I dont know if my body will allow that. I see you like taking performance supplements .Check this link out. All the things you need to get that boost to push harder in your workouts. The website will explain everything much better than I can.